We’re Here to Help with your pond fountain! All Arbrux pond fountain are precision engineered to work flawlessly through all climate extremes for which they are designed. Pond fountains are built with quality components like stainless steel submersible pump motors, and are virtually maintenance free. Why should you choose an Arbrux Floating Pond Fountain? Turn ponds into a beautiful experience with a floating pond fountain. 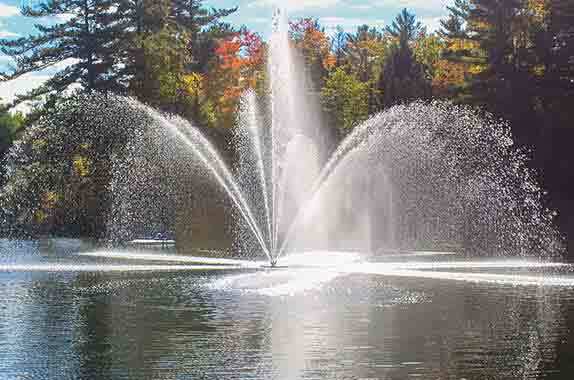 Arbrux floating fountains are used by private estates, golf courses, municipalities, corporations, and by home and cottage owners. Six spray patterns are available in various heights and widths. Floating Fountains make a spectacular visual statement and they improve the quality of your pond or lake, through water circulation and oxygenation. The show doesn’t have to stop when the sun goes down. Arbrux floating fountains have optional underwater LED lighting kits to create a multi colored dramatic effect into the evening hours. If people are enjoying your property at night, an LED lighting kit is a perfect addition to your Lake Fountain package. Imagine evening photos taken in front of a coloured water fountain in your pond.